All the final year students of B.Sc. (Chemistry), B.Sc. (Bio-chemistry) and M.Sc. (Chemistry) are required to be present and take the seats by 12:45 PM. Students are supposed to submit their individual Action Plans at the end of the session. The Final year students of B.Sc. (Chemistry), B.Sc. (Bio-chemistry) and M.Sc. 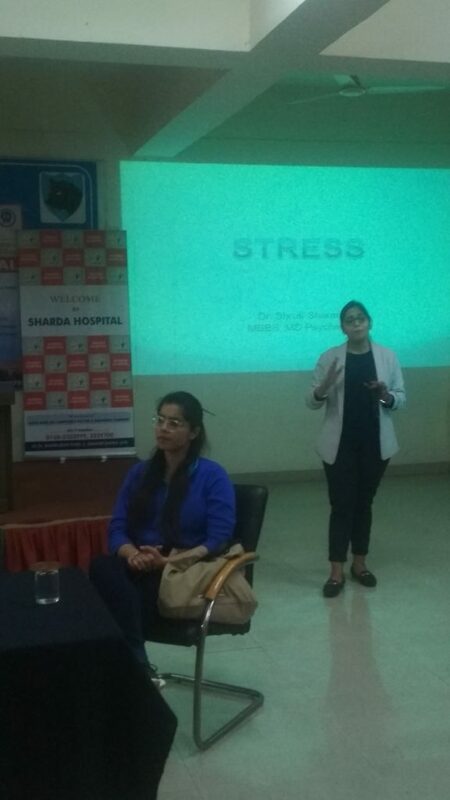 (Chemistry) will be trained by Ms. Sujatha Singh, Director –Organizational Development-Sharda Skills to make them ready for Job. Small and Medium Enterprises of NCR, are either not familiar with the export process or exporting their products and want to expand the business. 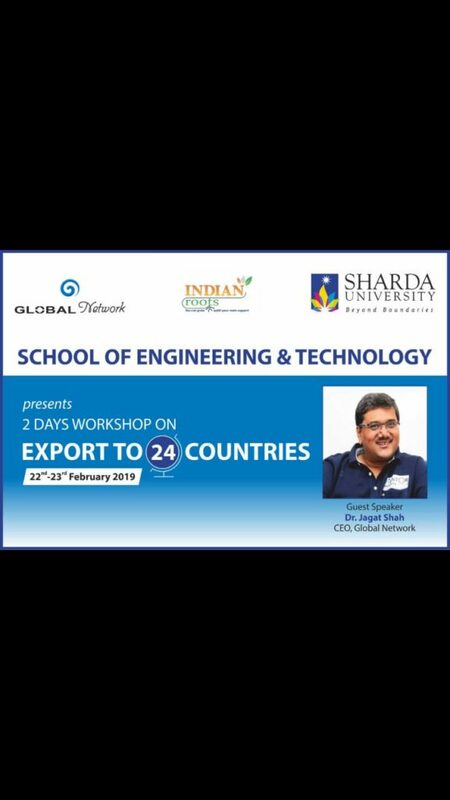 Sharda University in collaboration with Indian Roots Trust (Global Network partner in NCR), conducting this workshop, where 25 Industries are participating .Mr. Jagat Shah-CEO Global Network will guide the industries on the Export Process, Export Market etc. Alternative Dispute Resolution (ADR) refers to a set of practices and techniques aimed at permitting the resolution of legal disputes outside the courts. It is encompasses mediation, arbitration, and a variety of “hybrid” processes by which a neutral facilitates the resolution of legal disputes without formal adjudication. 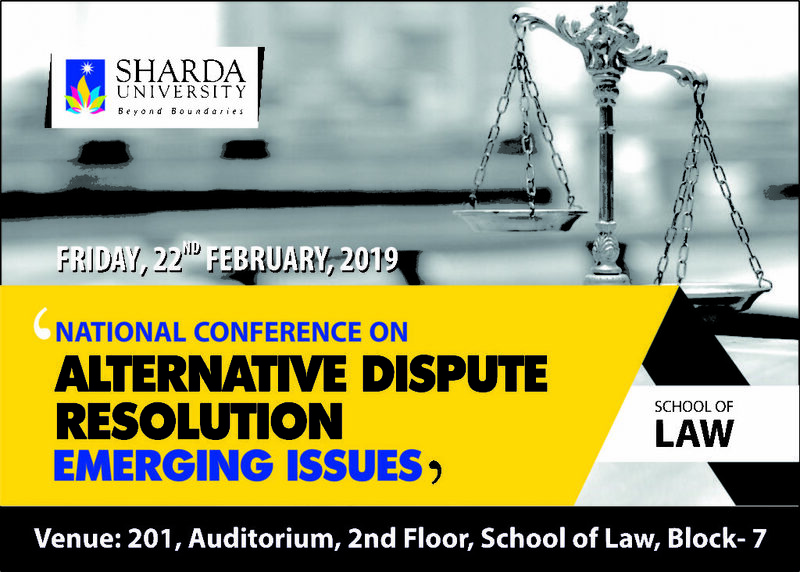 To impart greater awareness about the alternative platform available to a litigant as oppose to the conventional form of instituting a suit. 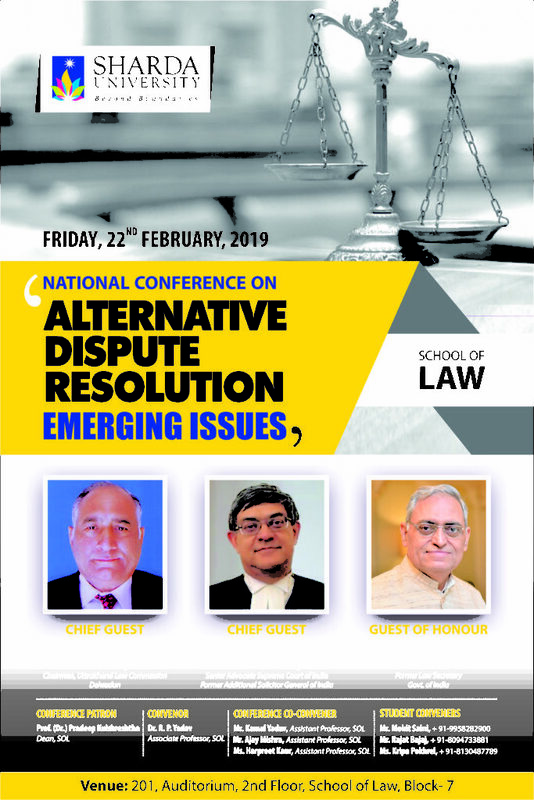 To understand Alternative Dispute Resolution in India is an attempt made by the legislators and judiciary alike to achieve the “Constitutional goal” to achieve complete justice in India. The Department of Community Medicine (SMS&R) along with Dept of Public Health Dentistry (SDS) and School of Allied health science is organizing school health camp under the school health program at D.P.S School, Ghangola in the catchment areas of RHTC Panchaytan on 22/02/19. Approximately 400 Students along with their family members will be participating in the health camp. 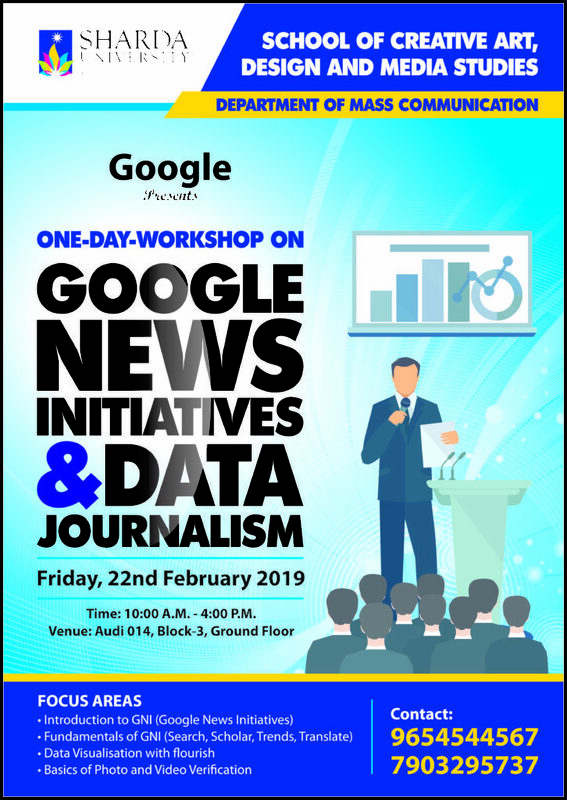 Department of Mass Communication, School of Creative Art, Design and Media Studies in collaboration with Google, is organizing One-Day-Workshop on Google News Initiatives and Data Journalism on Friday, 22nd February 2019. To disseminate information about fake news, photos and videos and how to identify them. To filter and interpret news-worthy data from Google search. To inculcate better understanding on Online & Convergent Journalism. To facilitate students interaction with the guests from Google about Google products related to Journalism. Department of Mathematics and Centre for Advanced Research in Applied Mathematics & Physics (CARAMP), SBSR, Sharda University is organizing an expert lecture on “Carbon Nanotubes and its applications” by Prof. Mushahid Husain (Former- Director Nano science and Nanotechnology Centre and former Vice Chancellor M. J. P. Rohilkhand University, Bareilly ). He is having more than 31 years of teaching experience. He has published more than 200 research papers in national and international journals. He produced more than 45 Ph. D and completed many research projects. Carbon nanotubes are still being considered as one the most intriguing nano materials of the 21st centaury. The exceptional and extra-ordinary properties of CNTs make them as the most researched materials for the most of the potential applications like sensors, super capacitors, field emission, medical applications to name a few. CNTs can be synthesized by various methods including Laser Ablation, Arc-Discharge and Chemical Vapor Deposition methods. Although numerous experimental studies have already been carried out, computational analysis of this important nanomaterial is still lagging behind. Computational simulations have started to become an essential part for material’s application and design. It can efficiently replace previous development methods for new materials based on trial and error. There are basically three different computational approaches for modeling and simulating the behavior of CNTs. It can be categorized into: (i) atomistic modeling, (ii) continuum modeling, and (iii) nano-scale continuum modeling. By employing an appropriate modeling technique, it is possible to generate each wall of imaginary CNTs with the help of a graphene sheet that has been rolled into a seamless tube with a constant radius. These modeling techniques are very effective in predicting the position of atoms depending on the interactive forces and boundary conditions. This talk gives the analytical behavior of CNTs particularly singe-walled carbo nanotubes (SWCNTs) under a forced vibration in any medium. 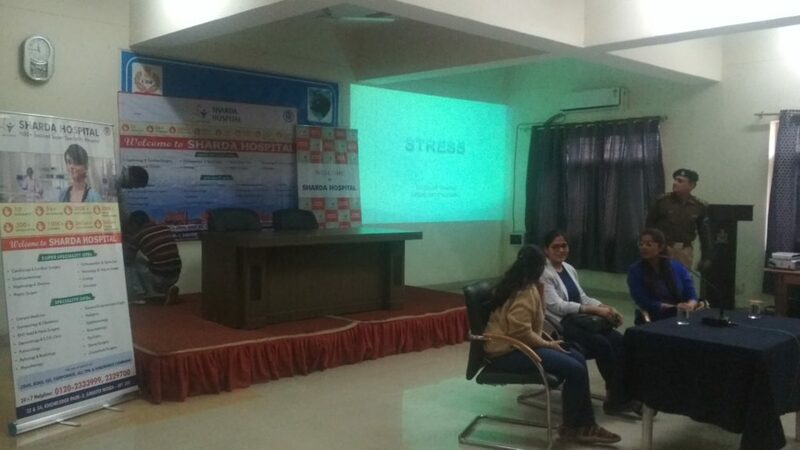 It will give an insight to the dynamic response of SWNTs for various values of certain parameters of the dynamical system by using computational techniques such as plot time series, phase plots and Poincare map to confirm the chaotic behavior of SWCNTs. Department of Design, School of Creative Art, Design and Media Studies, are planning to organize for a SAINT-GOBAIN Product Display Workshop & Interaction Session on 28th February 2019. 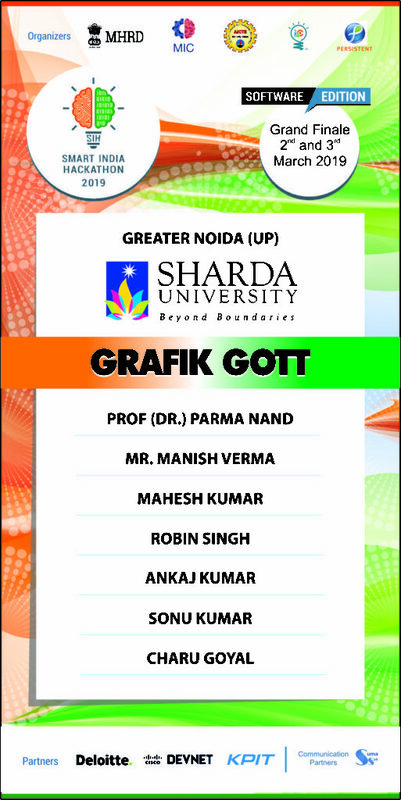 This workshop are looking for all products like Dry Wall partition, False Ceiling and Gypsum Plaster etc which will be beneficial for students as well as Faculty. Saint-Gobain designs manufacture and distribute materials and solutions that improve the comfort of each of us and the future of all. Saint-Gobain products are found everywhere in our daily lives: from the home to the office, in cars and infrastructure, and high-performance materials for health and many industrial applications. What sets them apart is Saint-Gobain’s approach. The Group aims to meet today’s individual requirements for comfort, performance, safety, aesthetics. It also aims to take up the collective challenges of the future, from construction to sustainable mobility, from population growth to climate change. The workshop aims to meet today’s individual requirements for comfort, performance, safety, aesthetics. It also aims to take up the collective challenges of the future, from construction to sustainable mobility, from population growth to climate change. We are pleased to invite you on the occasion of celebrations of “National Science Day”. On this Occasion, RTDC in collaboration with SBSR and SET will be organizing a meeting of Deans and HoDs of SBSR and SET at 2.30 PM in RTDC boardroom tomorrow (28-02-2019) to commemorate National Science Day”. Kindly grace the occasion for a panel discussion on “Relevance and Promotion of Interdisciplinary Research”. You are most welcome to present your work recent work (5 min, 5 slides) on this occasion. 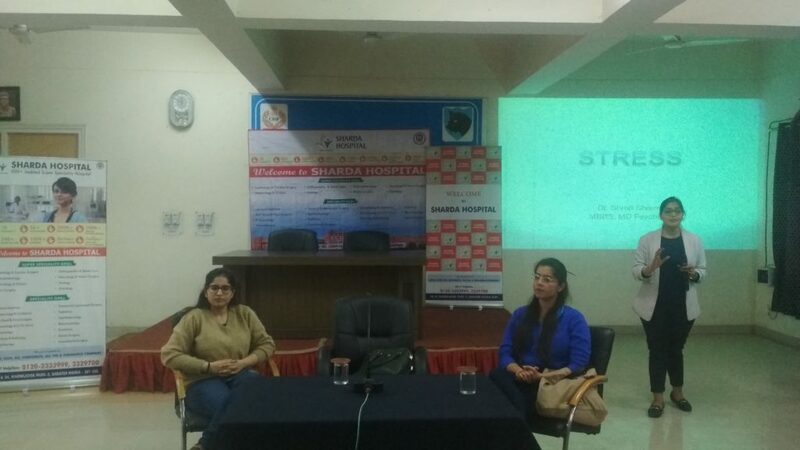 Department of Computer Science & Engineering, SET student’s and faculties are representing Sharda University in the “Smart India Hackathon 2019”, software edition organized by Ministry of HRD from March 1, 2019, to March 4, 2019. 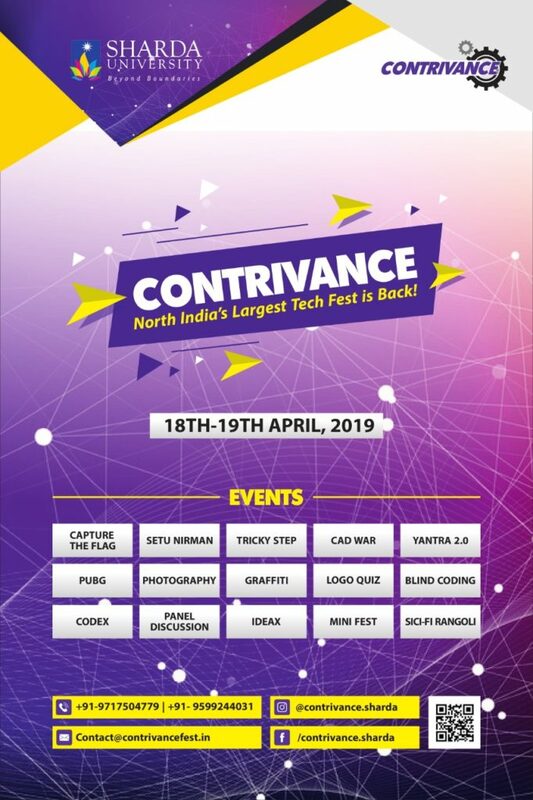 Smart India Hackathon 2019 is a nationwide initiative to provide students a platform to solve some of pressing problems we face in our daily lives, and thus inculcate a culture of product innovation and a mindset of problem-solving. 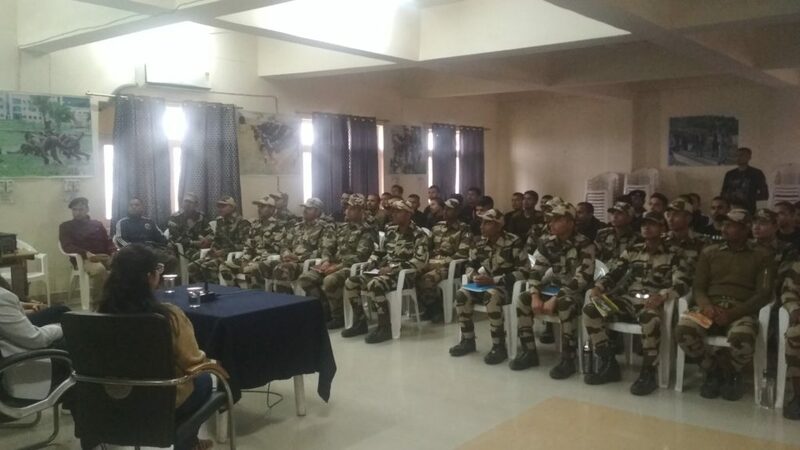 An initiative by the Ministry of HRD, AICTE, Persistent Systems, i4c, and RambhauMhalgiPrabodhini. 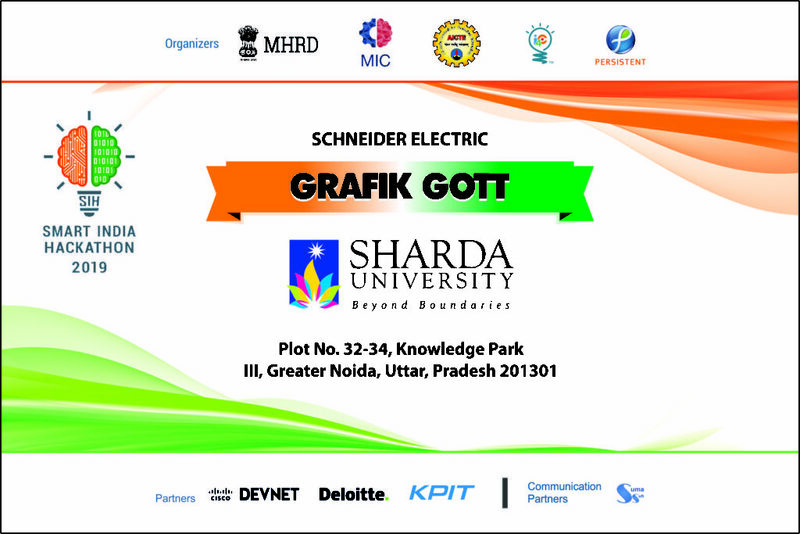 The 3rd edition of the highly successful Smart India Hackathon initiative. Ministry of HRD, AICTE, Persistent Systems, i4c, and Rambhau Mhalgi Prabodhini. Department of Computer Science and Engineering, SET is organizing Industrial visit at Microsoft Office,Gurgaon| 2nd March 2019, @ Microsoft Office,Gurgaon, Haryana. Department of Computer Science and Engineering, SET is organizing Industrial visit at Microsoft, Gurgaon for M.Tech Students on 2nd March 2019.